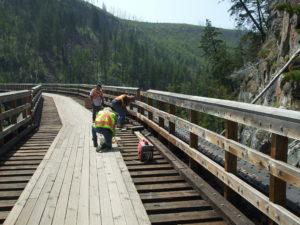 The BC Parks Contractor will be doing extensive trail work using heavy equipment between Trestle 17 and Myra Gate. 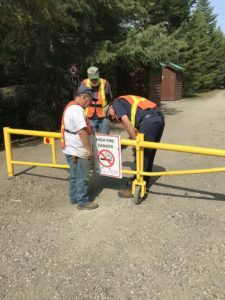 This may result in stoppages on the trail as needed until they can clear it for safe passage. Please follow safety instructions from this contractor. 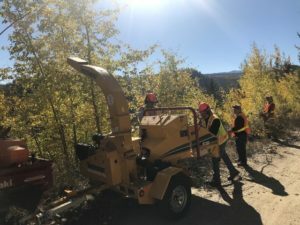 Preparing the Myra Canyon garden for 2019!! July 14th volunteer workers – Great Work and Thank YOU! Saturday’s volunteer work crew included George, Gord, Tom, Ted, Roy, Gary, Denis and Kelly – all supervised by Denney. 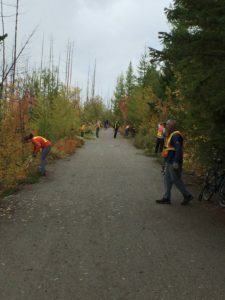 The work included cutting back new growth over the trail between Trestle 3 and just past Trestle 6. This work keeps Myra Canyon looking spectacular!